Maximum Depth: 40m / Visibility: >30m / Currents: Low / Prerequisite Certification: Open Water Diver / Distance from the diving center: 15 min. 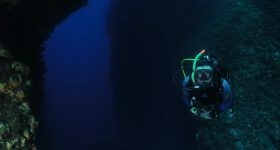 Colovri is by far the most famous dive site that Corfu has to offer. Much has been written about it. 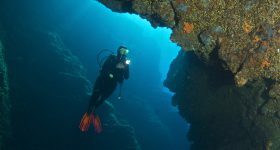 In the international press it is counted among the 1000 most beautiful diving areas worldwide. The last report in the German magazine “Tauchen” of June 2006 describes it as the “Southern Cross”. Around Colovri are gigantic steep drops to 120m depth. 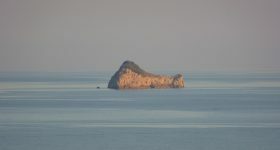 An island of 2000 square meters in the middle of nowhere where the sea drops away to the abyss! A place where you can dive 3 or 4 times at different diving spots each time and you will still want to dive again. Numerous fish of different kinds like beautiful anthia, shrimps, crayfish, groupers, barracudas, moray eels are some of the fish you can see during this dive. There is an amazing swim through full of invertebrate life. 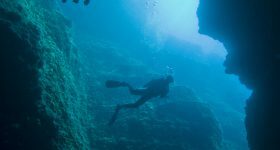 Maximum depth at this location is 40m however, if you’re a newbie then there is plenty to see and experience up in the shallows.